Petawawa River Inn and Suites is located approximately 5 hours drive East from Toronto and 2 hours drive West from Ottawa. 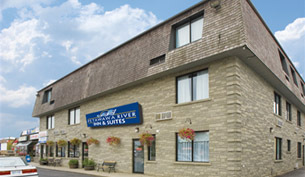 If you are visiting or working at Canadian Forces Base Petawawa there is no hotel more comfortable or perfectly located than Petawawa River Inn and Suites. We are a CAA diamond rated and 31/2 star Canada Select rated full service property. We are conveniently located in downtown Petawawa and serve the areas of Petawawa, Pembroke, Chalk River & Deep River. The Great Canadian Warehouse is the perfect retreat for refreshments, entertainment or a game of pool. Be sure to visit the Hottest Night Club in the Ottawa Valley. At Country Style, we grind our coffee beans to a precise fineness immediately before brewing every single pot of Country Style Coffee. We also insist on offering you 18% cream to compliment the full-bodied taste of our coffee. This ensures just the right coffee flavour! Try us today! We are a full service agent with courier express service. It's your Country, explore it with Greyhound Canada. You will find the freshest pizzas, salads and more, all fresh to order. Give us a call at 310-30-30. Everyone agrees that our crew are "The Toast Masters"! If you like quality and freshness, you will love Capt. Sub. Pronto, open 24hours a day, 7 days a week, is our convenience store. Pronto's got what you need at a price you'll really like! Snowmobilers': We are minutes off Top Trail "A"